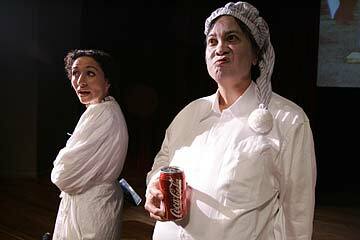 Cynthia Ochoa, left, is Mrs. McKinley, scolding her husband, the president, played by Michael Leong in "To U.S. with Aloha and Mabuhay." THE ACTORS Group is doing its part to commemorate the centennial of Filipino immigration to Hawaii with Virgilio Menor Felipe's "To U.S. With Aloha & Mabuhay." The narrative focuses on the unfortunate circumstances through which the United States acquired the Philippines, rather than on the experiences of Filipino immigrants in Hawaii, but it's a history lesson Americans of all backgrounds should take to heart. "To U.S. with Aloha & Mabuhay," presented by The Actors Group, continues at 7:30 p.m. Friday and Saturday, and 4 p.m. Sunday at Pearl City Cultural Center. Tickets are $15. Call 222-3133. The story begins with the funeral of a modern-day immigrant who came to the United States, joined the Army and died in Iraq. We then jump back to 1898 and President McKinley's infamous musings about America's duty to "civilize" and "Christianize" the Philippines after the Spanish-American War. Dismissing the Filipinos as being mostly "heretics and Catholics," McKinley decides that it is America's duty to bring freedom to the Philippines by occupying it for geopolitical reasons. Subsequent scenes show the American attack on Manila, collusion between the Americans and the Spanish in the transfer of ownership, America's cold-blooded betrayal of its Filipino allies, and an American military unit committing atrocities against suspected Filipino "insurgents" and non-combatants. Act II jumps forward several years. The Americans arrest a Filipino teacher and charge him with sedition when his students put on a badly written comedy sketch that mocks America's founding fathers. The tone of the political commentary is reminiscent of Hawaii Pacific University's Y2K production of "Tintypes," or Sean T.C. O'Malley's satirical musical "Politicians, Elections and Other Obscenities" at the University of Hawaii-Manoa in 1992. McKinley is played by an Asian in whiteface, several members of his Cabinet wear one-size-fits-all white masks, and anachronistic cultural references abound. Cast members Richard T. McWilliams and Thomas Smith shoulder the white man's burden in playing an assortment of villainous Americans and Spaniards who have no redeeming qualities whatsoever. McWilliams reinforced the mood by declaiming Theodore Roosevelt's expansive views on America's proper place in the world. Smith, playing American naval strategist Alfred Mahan, earned applause and laughter when he prefaced Mahan's report on geopolitics with a loose-limbed dance routine performed to the Rolling Stones' hit "Start Me Up." Several members of McKinley's cabinet also danced the Charleston. Jesus Basuel was reminiscent of old-time Booga Booga member "Dangerous Dave" Lancaster, playing an inattentive Filipino school boy. Basuel also distinguished himself on opening night, improvising when an essential prop broke while he was playing an American officer during the attack on Manila. Dance also proved important in telling the story. Veteran actor/choreographer Lito Capina and Cynthia Ochoa close Act I with a beautiful pas de deux that suggests the spirit of the Filipino people rising above the horrors of American war crimes. Playwright Felipe occasionally takes a break from political commentary with scenes representing daily life in the Philippines. These scenes -- a marketplace, picking fruit and a demonstration of traditional tinikling dancing -- seemed to resonate most strongly with the audience on Friday. The final scene is an audiovisual presentation that salutes various Filipino Americans for their accomplishments in Hawaii since Peter Aduja was elected to the Territorial Legislature in the mid-1950s. Everybody likes a happy ending, but the leap from American war crimes a century ago to local pop icons such as Emme Tomimbang and Jasmine Trias is huge and extremely abrupt.